A pretty scene! The plants add so much to a room! I love that you have so many plants! My work desk looks like that too! 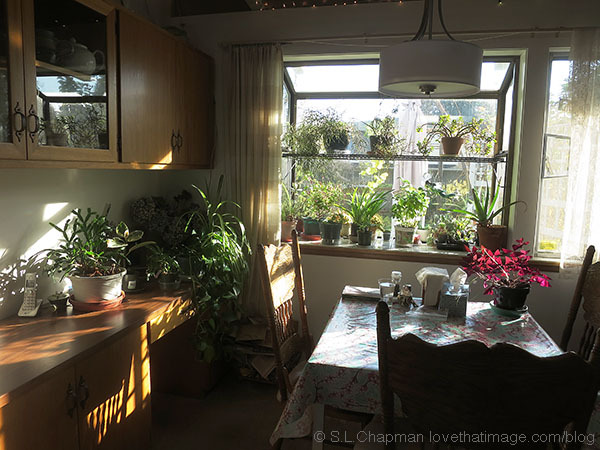 The plants looks very happy in that window and must love the sun they get. fabulous photo of a beautiful space!!!! Happy Thanksgiving! Looks like a lovely setting in which to share tea or coffee with a friend. We’ve had a couple of days of relentless rain but this afternoon it was so nice to have the sun come through the back windows in the kitchen and dinning room.